1.Heat large saucepot of salted water to boiling over high heat. Add pasta and cook as label directs; drain. 2.Meanwhile, in large skillet, heat 1 tablespoon oil over medium heat. Sprinkle salmon with salt and pepper; add to skillet and cook 5 minutes or until browned. Turn salmon, cover and cook 5 minutes longer or until internal temperature reaches 145°. 3.In separate large skillet, heat remaining 1/2 tablespoon oil over medium heat; add olives and capers and cook 3 minutes, stirring frequently. Reduce heat to medium-low; add pasta sauce, cover and cook 5 minutes or until heated through. Stir in basil. 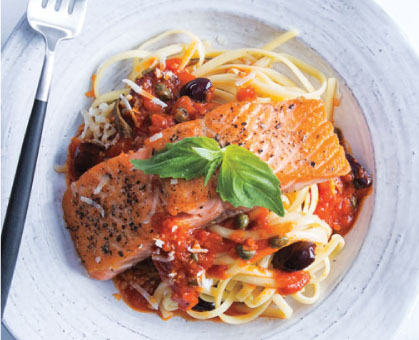 4.Serve pasta topped with sauce and salmon fillets; sprinkle with cheese.